Shirley Cuffie, Community Program Specialist, invited GSCM’s new CEO, Violet Apple, out to one of the Community Programs that she facilitates, and Violet came right away! Community Programs Specialist, Shirley Cuffie and Girl Scouts CEO, Violet Apple with the Kindergarten and 1st grade girls of Gardenville Elementary School in East Baltimore city. 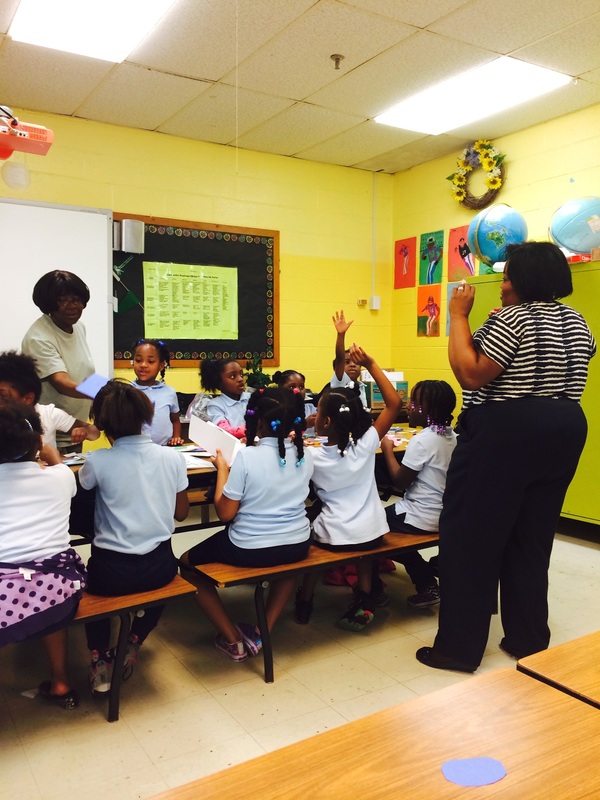 Gardenville Elementary, located in East Baltimore City, has been a partner school with GSCM since the beginning of the 2013-2014 school year. Each of their grades has had one of our Community Programs this year, and the girls have loved every minute. Violet, along with the Community Programs Director, Candace Baker and Community Programs Coordinator, Andrea Kennedy, attended Shirley Cuffie’s Reading Rocks program on Wednesday, May 28. The girls were so excited to have visitors and were eager to share what all they’ve learned about Girl Scouts and reading so far with Ms. Cuffie’s help. It wasn’t long before Violet jumped in and began helping the girls create their craft fish to go along with the Rainbow Fish story that was read that day. She joined the girls in trading fish scales decorated with their names written on them. When their crafts were complete, quite a few of the girls had a fish scale that read “Violet Apple” on their complete craft. Violet was also left with a few token scales from the girls with their names on them as well. It was truly a fun hands on experience for Violet. Our department is thrilled that she came!